A woman in a kago (palanquin) carried by two bearers. They are holding ikizue (breath sticks) to regulate their breathing while walking. In this fanciful image, the woman is carrying a sword. 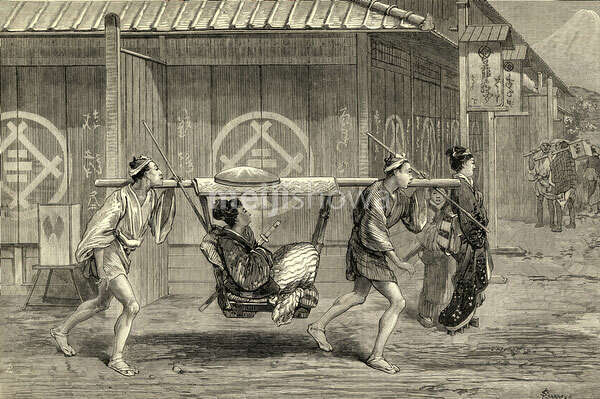 A kago is a palanquin suspended by a single crossbeam which is carried by two men. A cushion was used to absorb shocks. The sides were usually left open, but could also be encased by screens. This form of transportation was very popular in Japan until it was replaced by the jinrikisha (rickshaw) in the late 19th century. Published in The Illustrated London News on November 2, 1872 (Meiji 5).